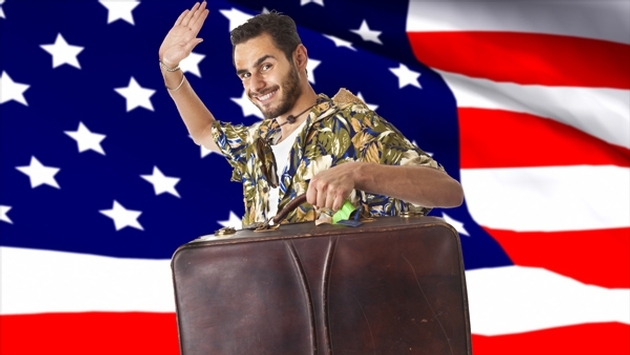 AAA Travel projects 41 million Americans will journey 50 miles or more from home during the Independence Day holiday weekend, a 1.9 percent increase from the 40.3 million people who traveled last year and a nearly 14 percent increase compared to the Memorial Day holiday weekend. The majority of travelers will be celebrating their freedom with a road trip, with more than eight in 10 (34.8 million) choosing to travel by automobile, the highest level since 2007. 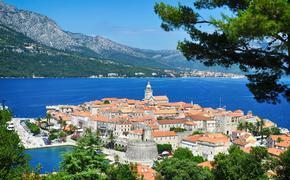 The Independence Day holiday travel period is defined as Wednesday, July 2 to Sunday, July 6. 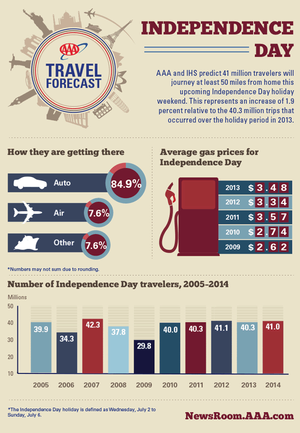 AAA expects the majority of U.S. drivers likely will pay the highest gas prices for Independence Day since 2008. Today’s national average price of gas is about 20 cents per gallon more expensive than the average on July 4, 2013, which was $3.48 per gallon. In recent years gas prices have declined in the weeks leading up to Independence Day, but this has not occurred this summer due to higher crude oil costs as fighting intensifies in Iraq. AAA does not believe that high gas prices will have a significant impact on the number of people traveling, but it could result in some consumers cutting back on dining, shopping or other trip activities. AAA provides the latest gas prices for the nation, states and metro areas at FuelGaugeReport.AAA.com.